McDowell immediately mentioned his concern to Dottie Pepper, the roving course reporter from The Golf Channel, and she alerted the Rules Officials. After completing his round, but before signing his scorecard, McDowell went into the TV booth to watch slow-motion replays. The video evidence confirmed his apprehension and he called the two stroke penalty on himself for a violation of Rule 13-4, which prohibits grounding a club in a hazard. He then signed his scorecard with a double bogey 7 on the last and returned it to the Committee. Instead of lying in second place, just one stroke behind the leader, he found himself down in fifth place, three strokes down. I am sure that many readers are wondering why dipping your club in water on the backswing should incur a penalty. Surely, there is no way that this action can give you any information about the condition of the water that might help you in completing your stroke. Well, I don’t pretend to know why this is the Rule, but it is consistent with the fact that players may not touch sand in a bunker (the other type of hazard) during their backswing. So, be careful not to dip a hand, or club, in the water before making your stroke, there may be an eagle-eyed Rules enthusiast observing you! 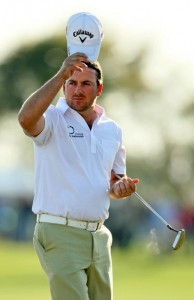 I suspect that Graeme McDowell wishes that he had taken a penalty drop from the water hazard on the 18th. After his round he admitted, “It's a disappointing way to end the day but, it could be worse, we don't get that much practice playing out of water!” Exactly! Unless you regularly practice playing out of water, don’t do it! “A player must not make a stroke at his ball while it is moving. * Ball falling off tee - Rule 11-3. * Striking the ball more than once - Rule 14-4. In the first case, the ball is not in play, so if a stroke is made at it, whether it is moving or not, the stroke counts but there is no penalty. If a ball at rest anywhere else on the course moves as the player makes their stroke it does count, but they are not exempt from any penalty under Rules 18-2b. In the second case, there is only one stroke counted but there is a penalty for hitting the ball twice. And in the third case, there is no penalty if the ball in water begins to move after the player has begun their backswing, unless they caused it to move. If you would like a reminder whenever I post a new blog item just enter your email address in the top right hand corner of this web page. You can unsubscribe at any time and you have my word that your details will not be shared with anyone else. I don't know what kind of coverage you got over there, but here in the States, the network tried to make it sound like McDowell wasn't going to take the penalty unless he saw it on TV. Completely wrong. Listening to McDowell after the shot, he was calling the penalty. He went to the TV screens hoping he was wrong - not the other way around. Thanks for clarifying that for us. In 2004, Rule 18-2c was removed from the Rules of Golf. Previously, if a player’s ball in play moved after he had touched or moved a loose impediment within one club length of the ball, the player was deemed, by Rule 18-2c, to have caused the ball to move (and he incurred a one stroke penalty and was required to replace the ball). With the removal of Rule 18-2c, it is a question of fact whether the player’s actions caused his ball in play to move. New Decision 18-2a/30.5 was added to clarify that point. Thanks. I have now taken out my incorrect reference to 18-2c from the final paragraph.